Whilst it feels good to get people nice gifts at Christmas, our shopping lists can really start to mount up and quickly turn the festive period into a time of money stress and worry. I don’t even buy that many gifts compared to some people (my mum’s to-do list is insane!) but I was still getting myself all het up trying to decide what to get for people and how on earth I was going to afford it. I’ve always loved the idea of hampers. They’re full of treats, look great and you don’t need to spend hours in a shop agonizing over whether they’ll actually like the gift you’re about to drop a small fortune on. There’s plenty of pre-made hampers you can buy around Christmas time but this year I’ve decided to make my own. Like I mentioned in my previous post (which you can find here), I’m a firm believer in thoughtful gifts over pricier ones. You don’t always need to spend a fortune to find something the person will love. The hamper for my mum is of course the most expensive of the three. I’ve included Thorntons chocolates (£1, Wilkos), two face masks (£5 for six, Amazon), Nip + Fab hand cream (set of three £4.66, Superdrug), Studio nail varnish (set of three £2, Superdrug), glass nail file (set of 2 £2, Superdrug), Snowman bath melt (£2.25, Lush) and an owl candle, slipper socks & hair turban (£2.50, £2 for 2, £1.50, all Primark). I’m also going to attempt to make these adorable hot chocolate reindeers and pop in a mini bottle of Baileys. Ahhh, boyfriend’s mothers can be so difficult to buy for. Danny’s mum loves the finer things in life so it’s always tricky trying to choose something for her that she’ll not only like but doesn’t cost a fortune either. The hamper idea is perfect, even posh people like to relax! For this one I’ve included two face masks, Nip + Fab hand cream, Studio nail varnish, Lush snowman bath melt, Thornton’s chocolates, slipper socks and a hand warmer (£1, Primark). I’m also going to buy a mini bottle of wine to finish it off. I don’t usually buy for my sister but since I have a job this year I decided to treat her. Out of the three this is the cheapest, it’s just a little extra something so I didn’t want to spend a lot. I’ve included two face masks, slipper socks, Candy Mountain bubble bar (£2.75, Lush), Studio nail varnish, candle (Primark, £1), hair turban and an ice cream melt phone case (£1.98, Amazon). My mum and sister always laugh at me when I wear my hair turban and so I’ve put the ugliest ones I can find in both of their hampers. I doubt they’ll actually use them but it’ll definitely get a laugh on Christmas morning and I’m really looking forward to them opening them. Initially I didn’t really have a ‘theme’ for the hampers, I just made a list of little things I could put in them and tried to keep costs for individual items as low as possible. They’ve ended up with a ‘pamper night’ feel to them as they’re filled with things like fluffy socks, bath bombs, candles and face masks. I tried to focus on what each person would like as well as some general gifts, for example Danny’s mum loves wine, my sister is obsessed with phone cases and my mum needed a new nail file. As well as putting in cheaper gifts, I also managed to cut costs by buying gift sets and splitting up the products. The baskets can be found here and are £2.50 each. I’ve also got some clear cellophane to wrap the hampers in once they’re completely finished (Amazon, £5.20) and some bows to finish them off (Amazon, £1.90 for 10). 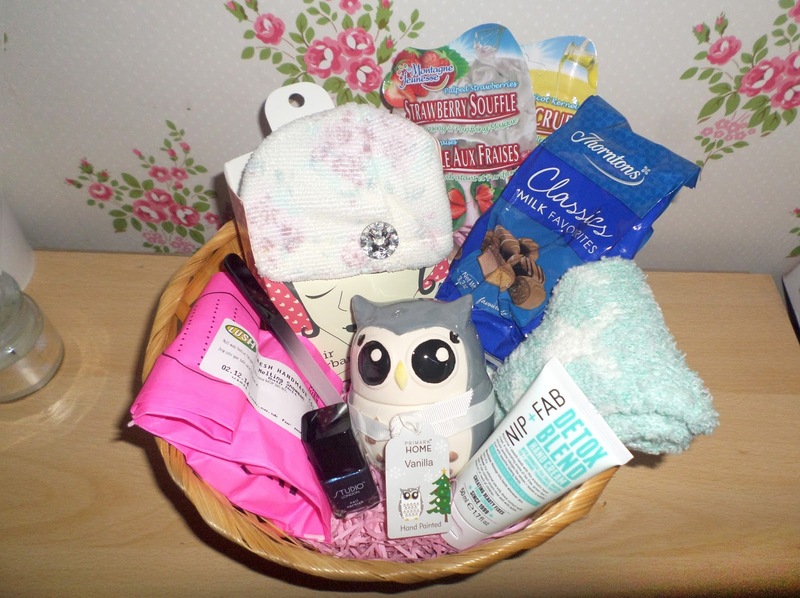 The pink paper in the bottom of the baskets is from the Card Factory and costs 99p per packet.